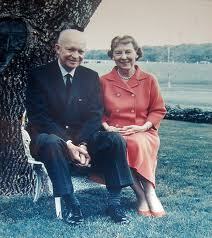 A level-headed leader of men and nations—Eisenhower is revered today by both conservatives and liberals. Presidencies, like good wines, improve with age. When a president leaves office the excess of familiarity has sown its bitter harvest of contempt—or at least boredom. There is too much excitement about his successor, too much anticipation of the new, for a completely fair appraisal of the outgoing chief executive’s legacy. But as the promise of the successor usually goes unmet and the heat of contemporary political battles cools to a more even temper, judgments mature, and the old guy starts to look a little better. George H.W. Bush left the White House a rather forlorn failure in political terms but within a few years was getting the credit he deserved for elegantly navigating the immediate post-Cold War minefield. Bill Clinton went out of office not so much under a cloud as enveloped in a miasma of Monica Lewinsky- and Marc Rich-scented scandal but today looks better and better as historians emphasize his budget-balancing and welfare-reforming legacy. Richard Nixon, the closest any president has come in the past century to being run out of town on a rail, at least gets credit for his China démarche. There will always be exceptions to this rule of course: Historians are never going to make Jimmy Carter’s presidency look like anything other than a one-term detour into economic and political oblivion. But there is no more powerful example of the growing-better-with-age theory of presidential history than Dwight D. Eisenhower’s two terms in the Oval Office (1953-61). In the Swinging ’60s that he unsuspectingly ushered in, the 34th President seemed an instantly outdated figure—the glamour of Camelot implicitly ridiculed the homely image of Ike and Mamie puttering around the White House in their slippers. His critics railed about the “missile gap” or the missed civil-rights opportunities, and the conventional wisdom quickly congealed around the proposition that Ike was a good general but a forgettable president. But serious reappraisal has been under way since the 1980s. Those rankings of presidents that magazines like to publish—if you take them seriously—have had Eisenhower (1890-1969) surging up the charts, now usually placing in the top 10, in the highly respectable company of Truman and Madison. And like all presidents with a passing claim to greatness, Eisenhower has entered that bipartisan pantheon where both Democrats and Republicans pay their obeisance. To Republicans, he is the man who won World War II, defeated the small-minded isolationists in his own party, cemented U.S. global leadership in the early stages of the Cold War and led the country through nearly a decade of well-armed security and small-government prosperity. To Democrats, Ike was the president who ended the Korean War, resisted the calls of the “military-industrial complex” for an early hot end to the Cold War by using nuclear weapons against China, built a national transportation infrastructure, and in Earl Warren and William Brennan appointed the leader and intellectual architect of the Supreme Court-led civil-rights revolution of the next 20 years. Jean Edward Smith’s highly readable one-volume biography, “Eisenhower in War and Peace,” is clearly designed to enhance Ike’s claim to greatness. Mr. Smith’s verdict on the Eisenhower presidency is almost unfailingly positive. He lauds his subject as, with the exception of FDR, “the most successful president of the twentieth century.” Eisenhower’s achievements, says Mr. Smith, were founded on a “progressive conservatism,” and the author is clearly eager to emphasize the progressive more than the conservative parts of that oxymoron. “His presidency provided a buffered transition from FDR’s New Deal and the Fair Deal of Harry Truman into the modern era,” he writes, a commentary that is a little more ideologically one-sided than justified by the historical record. Conservatives can object to this portrayal of the man as a liberal lion, a kind of Nancy Pelosi in khaki. Ike kept federal spending below 20% of GDP despite a vast defense budget, and he balanced the books throughout his years in charge. And conservatives who would like to reclaim Eisenhower as one of their own will surely give more weight to Ike’s own after-the-fact reservations about the hyper-liberal Warren-Brennan court than to the suggestion that the president was trying to reshape the American social compact through the courts. Mr. Smith is at his best—his most readable and least predictable—when examining Ike’s lengthy military career. Eisenhower’s record before he led the invasion of Europe in June 1944 was distinctly patchy, and Mr. Smith shows us that his ascent to the highest levels of the military establishment had much more to do with his easy mastery of politics than with any great strategic or tactical achievements. Eisenhower’s happy knack was for being in the right place at the right time and—as is true of almost anyone who rises in large organizations—benefiting from the advocacy and tutelage of powerful sponsors: in this case, John Pershing, Douglas MacArthur and, especially, George Marshall. “Fortuna,” Mr. Smith notes, repeatedly rescued Eisenhower from what might otherwise have been merely competent obscurity. In terms of raw military capability, he was never a match for generals like George Patton or Bernard Montgomery. But, unlike them, he was unencumbered by an excess of vanity and exuded calm in all situations. If D-Day itself was his strategic redemption, then the Battle of the Bulge a few months later represented his apotheosis as a military leader. As Mr. Smith notes: “He showed a quicker grasp of the situation than any of his subordinates, and acted decisively to contain the attack.” Even so, it had been Eisenhower’s own decision to attack the Germans along a broad front in Northern Europe, against the advice of his generals. The decision was described subsequently by Patton as “the most momentous error of the war,” enabling the Germans to break through the Ardennes pocket in the first place. 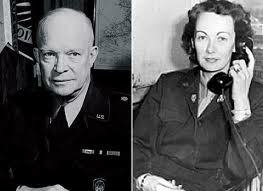 Mr. Smith is unstinting in his detailed documentation of Eisenhower’s long love affair with his Irish military driver, Kay Summersby (left)—a liaison that if it had become publicly known might have undone his political ambitions, not to mention his marriage. It is a reminder of the emotional complexity of a leader who was renowned for his sangfroid and self-control. In assessing Eisenhower’s two presidential terms, Mr. Smith makes little effort to disguise his admiration for the president and his dismay at the direction the Republican Party has taken in the years since. It’s true that there are more Reagan Republicans than Eisenhower Republicans in conservative circles today, but Mr. Smith underestimates the continuities between the two most successful Republican presidents of the postwar era. And the principles Eisenhower espoused and characterized—strong American leadership in the world, a clearly defined but limited role for executive government—are held by conservatives still. Despite the spate of revisionist histories in recent decades, Eisenhower remains an enigma: A quiet man projecting an image of almost leisurely detachment whose leadership won a global war and helped secure for America its position as unrivaled leader of the free world. Here was a Republican and conservative who took on his own party in Congress and trounced his political opponents at almost every turn. Here was a warrior who inveighed against the dangers of an overly militarized nation. After his death, Ike’s grandson, David, asked Mamie whether she felt she had really known the man: “I’m not sure anyone did,” she replied. Mr. Baker is the deputy editor in chief of Dow Jones. A version of this article appeared February 18, 2012, on page C7 in some U.S. editions of The Wall Street Journal, with the headline: A Supreme Confidence. This entry was posted in Biography, Book Review, International Affairs, Leadership, Politics. Bookmark the permalink. It takes years after his passing in 1969 for Americans to begin to appreciate Eisenhower’s contribution to War and Peace. 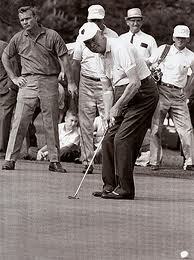 The Camelot people of the JFK Presidency and their friendly media painted him as a dull and grandfatherly president. Politics is not just glamour and hype. It is also about performance on the job. Ike was a performer. As Baker, the reviewer, says “[H]ere was a Republican and conservative who took on his own party in Congress and trounced his political opponents at almost every turn. Here was a warrior who inveighed against the dangers of an overly militarized nation”(military-industrial complex).